Another community meeting. Our state politician stands in front of two-hundred concerned and ready- to-help citizens. The meeting was called by concerned parents and teachers; people who believe that open, honest discussion and examination of facts will help save our public schools. The meeting progresses and all of the information given by the organizers about the state’s economy and our ability to save our public schools is negative. There are limited tax revenues, no time, no political will. One can see hopelessness on the faces of anxious parents and concerned educators. The politician, who has been involved in the demise of public education for well over a decade, is not naïve, he is not misinformed, he is, in fact, part of the insanity that has taken over the state and is openly destroying public education so that now private, religious, and charter schools have access to our public tax dollars. He stands before this hopeful group and omits what he knows, that these are dollars diverted from district schools, the very schools this assembly is concerned about. (Even though charter schools are classified as public schools, they should not be. They do not have elected boards, are not effectively monitored, provide partial curriculum, and too many are profit-driven). His presentation compares this state’s funding percentage to another nearby state. He fails to mention that in our home state, a war on public education, teachers, and worker representation has been implemented for more than twenty years. He never mentions the hundreds of millions of education dollars that are lost and unaccounted for. Or that whole financial systems and even buildings are being replicated at great cost to taxpayers. These are dollars that are taken away from the delivery of services to children. He knows that charter operators are their own bosses, making financial and other decisions that, more often than not, put money into their own pockets and those of their family and friends. He is well aware that charter operators can use the dollars allocated for the education of each child to buy buildings for themselves, or lease space to replicate the schools the taxpayers have already built. He knows that too many of the Schools of Choice determine their own curriculum which is too often biased and fact-adverse. He knows that many charters are subcontracted to profit-driven entities. He knows that trained and experienced teachers are not required in charter schools, contrary to a significant body of evidence demonstrating the increased impact of professional, experienced teachers on learning and human development. He knows the history about how accountability for charter schools was undermined when the legislature circumvented the State Board of Education to create a State Board for Charter Schools whose base purpose is to eliminate reporting standards that led to accountability. As Schools of Choice are running rampant, existing district schools are losing students, funding, and their infrastructure is degrading. After his presentation, there was no time allocated for questions. The organizers set the ground rules and the agenda. No controversial questions allowed that might embarrass the elected representative. Nothing allowed in the information provided that addresses the problem of state funding for education. No suggested solutions. In fact, the billion-dollar black cloud hovering over the room is never acknowledged or addressed. An agreement that although we are going through some tough economic times, what is hurting schools in our state is a political and ideological group whose purpose is to starve, weaken, and destroy public education. A demand that every charter school provide a complete account of every dollar spent. The district schools do this now. Follow the money and stop the abuses. Stop profiteers. Separate church and state dollars. Apply the same accounting laws/regulations that district schools are required to follow. Agree that charter schools are really only partial schools that do not have the capacity to provide a comprehensive education, and that parents need information about the damage a partial education can do for their child’s chances of success. Demand that the State Board of Education rescind the powers given to the State Board for Charter schools. (This may take legislative action). Re-empower the elected State School Board. Ask for the resignations of state officials making key decisions about our children and their schools who are not educators with experience teaching and operating educational systems. End the eras of politicians following ideological and fact-adverse experiments, who run our State Department of Public Instruction (Education). Of the 30% – 40% of the state budget now going to education, redirect millions of dollars from non-performing Schools of Choice to our district public schools, community colleges, and universities. Support the evolution, not the destruction, of our public education systems. End the intentional and planned attacks on teachers and teaching prowess, which have undermined classroom discipline and parent’s faith in quality education. End any cooperation with the Alliance of Legislative Executive Councils (ALEC) whose stated goal is to destroy public education and worker organizations. Make sure captive, subversive, elected representatives are exposed and voted out of office. Demand a head count of children driven out of our education system who leave school without mastering the fundamentals necessary for success. Children who drop out or are thrown back into district schools when a charter fails. Children who have received a partial education that does not prepare them for life. Identify and develop a plan to help tens-of-thousands of children who have lost access to the American Dream as a result of greed and ideologies held by a few very powerful individuals who have done this to us. Do not allow the use of tests to place, punish, or placate. The bias contained in tests currently designed by Pearson and “approved” by the USDOE are not effective indicators of mastery and must not be used. The purpose of tests is to enhance teaching not penalize students. Essential skills are measured by Mastery Criteria Checklists, and the application of knowledge to solve other problems, not rote memorization. 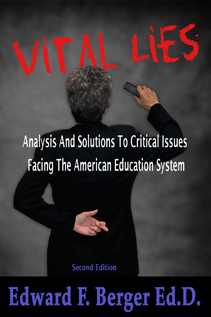 Avoid the so-called Common Core until it can be vetted. Hold public meetings where problems and solutions can be discussed and progress made.